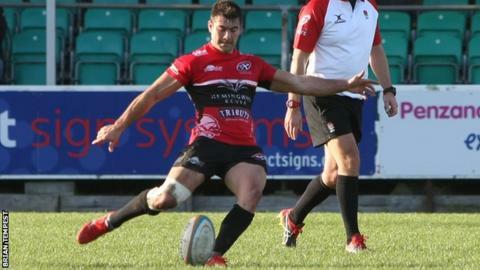 Argentina fly-half Javier Alvarez marked his full debut for Cornish Pirates with 17 points as they beat Bedford 22-20 in the Championship Cup. Alvarez kicked five penalties and converted Harry Strong's early try as the Pirates outscored the home side by three tries to one. The win put the Pirates second in their pool, a point behind London Irish, who they play next on Sunday. "Javier's been chomping at the bit for a while," coach Gavin Cattle said. "It's nice to see him get off the mark and put in a solid performance like that." Cattle told BBC Radio Cornwall: "He's completely different to what we've got, Will (Cargill) gives us that distribution and speed of hand whereas Javier is more of a running threat. "We didn't see much of that today because of the conditions, but he also showed that he can manage a game as well."